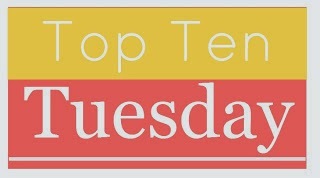 This week the theme is Ten Books I'd Love to Read With My Book Club If I Had A Book Club . I don't have a book club, but I'd love to. I started a wee one with some co-workers five or six years ago now, but when I left work due to pregnancy, I moved away as well and I've been book club-less ever since. If anyone out there would be interested in a book club featuring books similar to those that appear on my blog, let me know because I'd love to start a new one! I've actually read this epic fantasy once before, but I've never read the rest of the Wheel of Time series, which I'd like to do. I'd need to re-read this one to get started on that, and I think making it a book club selection would properly motivate me. I see this book everywhere and it always *looks* like a book club book to me. It's got the right amount of heft and serious but kind of quirky subject matter (judging by the blurb) to provide lots of discussion material. Sometimes I feel like I'm the only book blogger out there who hasn't read this one. I bought a copy last year but, like so many books that I've bought in the last couple years, I haven't found the time to read it. It also, absolutely, seems like a fantastic book club choice. Jim C Hines runs a blog that I think is easily one of the most interesting author blogs on the web. His series of posts recreating book covers is one of my favourites. If the book itself proved to be a dud for book club conversation, recreating book covers could easily sub in as an entertaining party game. Scalzi is another author for whom I have a lot of respect - but whose work I've never read. Red Shirts seems like a great place to start - plus a Hugo Award winner has to be good book club material, right? I could probably just start listing off all the books in my TBR pile, to be honest. I love to discuss books with people. Are you in a book club - what books have you read with it recently? If you're not, what's your top pick to read with an imaginary book club? The Wheel of Time series is awesome! You should definitely read the whole series! :) Happy reading!